A backsplash will protect your kitchen wall against food, water, and those dreaded oil splatters—and an interesting one can potentially take your kitchen from average to extraordinary. 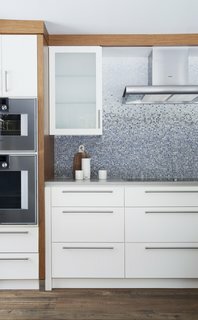 A well-designed backsplash will not only make it easier to keep your kitchen clean, but it can also add color, texture, or even a three-dimensional effect while helping create the exact atmosphere you want. Here are 12 great backsplash ideas to consider when creating your new modern kitchen or remodeling what you have. 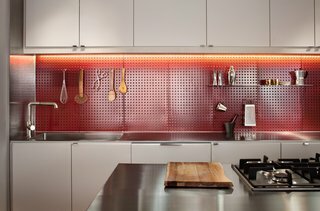 At a Boston loft in a former textile factory, Bunker Workshop created a minimal, efficient kitchen that features a red steel pegboard backsplash. Now that cooking utensils are easily accessible, the homeowner is able to prepare meals efficiently. 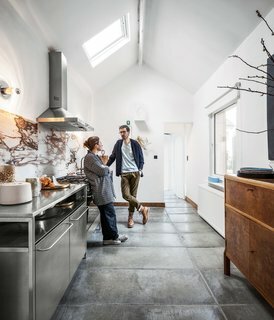 Passionate about recycling, Belgium designer couple Michaël Verheyden and Saartje Vereecke reused a veined marble top from a massive table from Vereecke’s parents’ house as the backsplash for their kitchen. 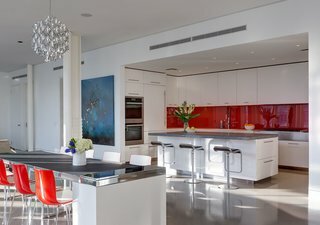 Though the home’s common areas are largely white and monotone, the kitchen introduces a pop of red, the owner’s favorite color, through the glossy AGC kitchen backsplash. Stone pietra cardosa counters are used on the center island, along with white Corian around the perimeter. 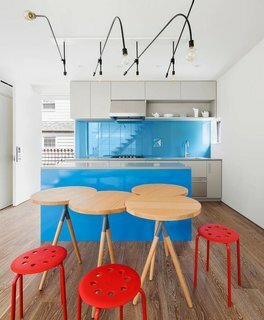 A Miele range, Sub-Zero refrigerator, and Piston stools by Shin and Tomako Azumi complete the space. 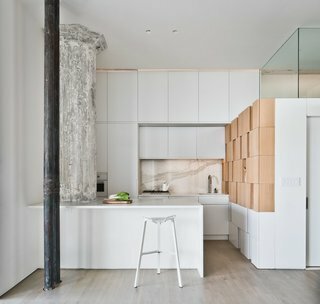 At a renovated loft in Brooklyn, a careful coordination of color continues in the kitchen, where the gray and white marble backsplash, lit with faint orange lights, mediates between the ashen column and ochre cabinets. In Ontario, this 19th-century home abuts a river, where the residents enjoy kayaking and swimming in warmer months. 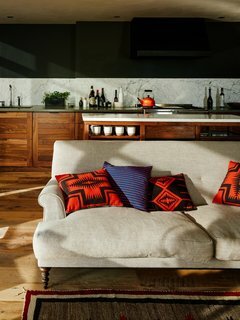 This geographic location partially inspired the wave-like backsplash. Each tile was hand-cut and individually placed by artisans from New Ravenna. The kitchen in the brother’s unit of this extended family home in Queens is bright and fun with a backsplash made of painted glass. The light fixtures, like many other materials found in the project, were left over from the client’s contracting work: O’Neill Rose bent the found pipes into an array of angles and attached light bulbs. 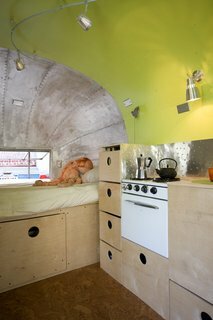 In this Airstream renovation, the owner was intent on keeping the original stove and incorporating it into the cabinetry. He created a backsplash using inexpensive aluminum flashing that he texturized with a ball pein hammer. 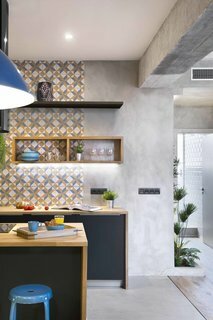 A backsplash with gray, mustard, and white hydraulic-imitation tiles from Portuguese brand Recer gives this Barcelona apartment plenty of dynamic and graphic charm. 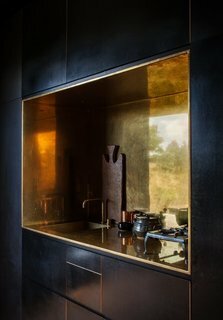 This off-the-grid cabin in New Zealand features a kitchen niche that's lined with polished brass. It works seamlessly with a tap by Arne Jacobsen for Vola that perfectly contrasts the otherwise spare, black, and minimalist interiors. 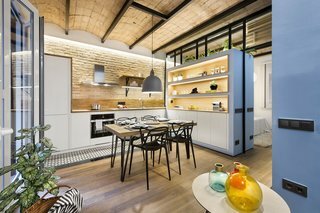 In this compact Barcelona apartment, an oak panel backsplash gives way to the original building’s old brick wall, presenting a wonderful play on natural textures. 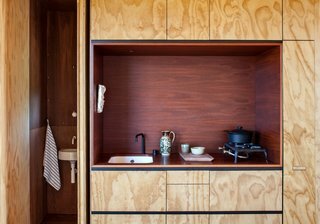 In this kitchen alcove in a New Zealand cabin, oiled jarrah eucalyptus contrasts with a kitchen niche made of plywood that's been stained reddish-brown. White marble with fine black veining was combined with a black wall to create a dramatic two-toned backsplash that adds a new dimension to the kitchen space.